Team DRC ready for the off! 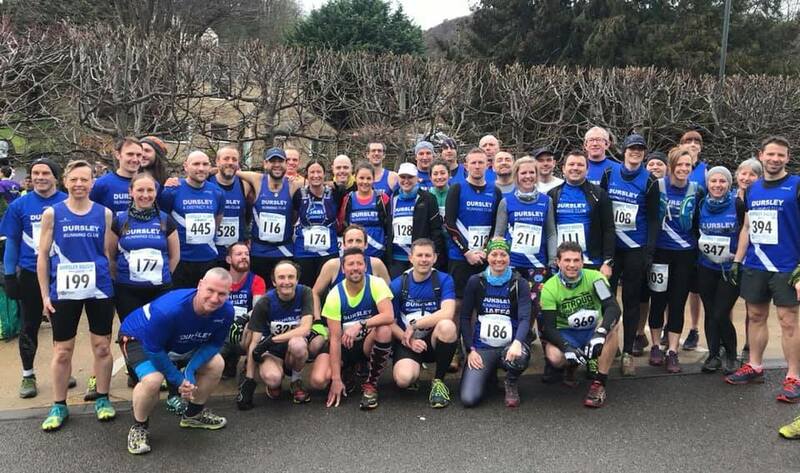 After months of planning and preparation Sunday the 10th of February saw the 2019 version of the Dursley Running Club’s Dursley Dozen taking place. Six hundred athletes had entered the race with 450 making the journey to Dursley, they were greeted by a chilly and overcast morning. This year race was marked by a large turn out from DRC reflecting the club’s growth with 75 entrants and over 60 finishers. Up until a week ago the course was quite dry but a week of persistant and heavy rain meant that it was going to be reasonably challenging underfoot. From the gun there was rush from May Lane up Hilll Road with those with an eye on a top placing keen to get into the woods ahead for the masses. James Everett led the way for DRC. Sadly for DRC Dan Anderson and Paul Hocking were not on the start line due to illness and injury, which was a blow to DRCs hopes of another win in the mens team race, with Robyn Wait missing from the DRC women’s team. Everett noticed that one of his competitors, James Pictor, was findng it easy enough to talk to him on the initial climb to the Golf Course, a concerning sign, as Everett was working hard at this point. 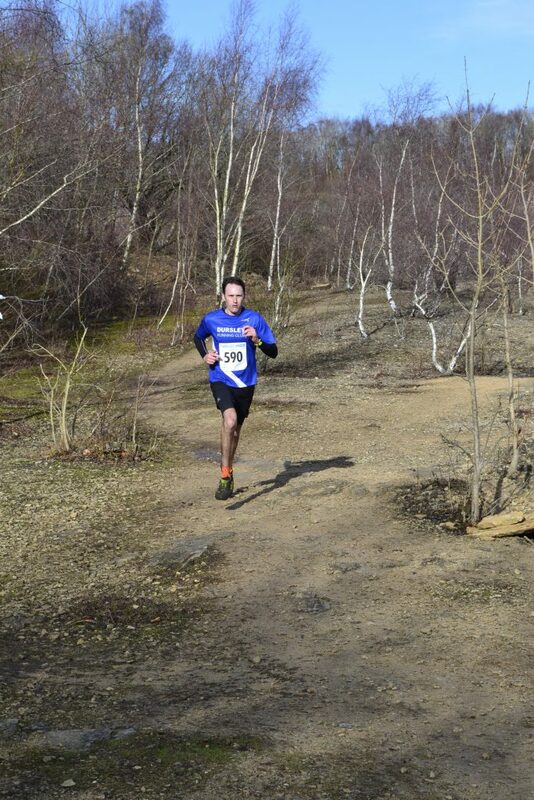 By the time the Pictor came off the golf course road and into the woods he had just over a minutes advantage of DRC’s Everett and Simon Byrne of Swindon Harriers. Xander McInnes was next in the woods for DRC. First woman at this stage was Annabel Grainger just three minutes behind the leader with Matt Read a minute behind Grainger. Next in for DRC were Ben Amigoni, Haydn Smith and Chris Sweet. Nicki Morgan of Chepstow Harriers (F50) was second woman at this stage with a 3-minute deficit on Grainger. DRC’s Zoe Lammerton entered the woods as 5th woman with Margaret Johnson a minute or so back. By the time they reached the Quarry Pictor, now running in bright sun, was now a clear two minutes ahead. Everett’s was second with two chasers within striking distance. Behind Everett for DRC it was MacInnes and Read, chased by Smith who had overtaken Amigoni, with Louis Rummer-Downing in the mix as well. In the woman’s race Grainger has almost 5 minutes on Morgan now, with Lammerton had moved into third position a further two minute or so in arrears. DRC runners were now coming through the Quarry thick and fast, Johnson just in advance of Jadie Cotterell and Kim Bird who were working well together. There was plenty of support around the course for all the runners and the course was well marshalled. As the runners ascended to the Golf course there was not much change in the key positions, with both the leading man and woman having commanding advantages that only a severe mishap would interfere with. At the finish Sam Pictor was a clear overall winner as was Annabel Grainger in the women’s category. Pictor floated around, unsurprising for an athlete who ran a 31:29 10K in 2018 and who posted that he was achieving 20 hours training a week mid-January. Grainger’s run was a master class in form and concentration. James Everett came home second overall and first for DRC. He was really pleased with his run he said it felt “harder’ but he was quicker than last year and he confirmed that conditions underfoot were definitely more testing than in 2018. Zoe Lammerton also continued to work hard to ensure she was not going to be caught on the run-in. She looked as strong as she had earlier on in the race as she started her decent in to Dursley. Zoe led a strong DRC women’s performance, with Johnson and Cotterall joining her to finish first Female Team. Bird, Lewis and Caroline Whitlock placing 3rd female team. Despite missing two key runners the DRC men’s team managed second place behind local rivals Thornbury with Everett McInnis, Smith and Read counting, DRC also supplied the 5th men’s team in the form of Amigoni, Rummer-Downing, Sweet and Jackson. There were at least two DRC personal bests on the day, Damian Lai and Louise Biddell were very pleased to smash their PBs on the course. There were a number of DRC athletes debuting some like Margaret Badger, a Walk to Run Graduate, and Hannah Osbourne vowing to marshal next year having experienced the challenge. DRC brought the race home with Nicki Cowle, Ben Houghton and Margaret Badger finishing in just over three and half hours. Overall Results Top 3: Male: Sam Pictor , 01:20:40, Un affiliated; James Everett , 01:23:51, (Dursley Running Club); Paul O’Mara , 01:24:29, (Tyne Bridge Harriers). Female: Annabel Grainger , 01:36:00, (Bristol and West AC); Niki Morgan , 01:46:12, (Chepstow Harriers); Zoe Lammerton, 01:48:30, (Dursley Running Club). As it was half term this week most of our programmes were taking a well earned break. 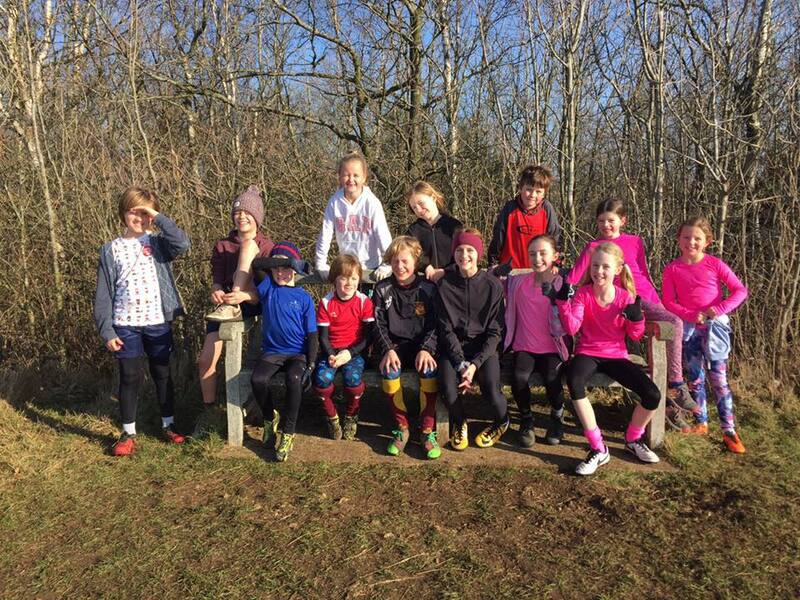 However, the Muddy Running session did run on Saturday and we had a fabulous time running on the golf course on a gloriously sunny morning. Just a perfect day for running in the countryside. The U21 Winter Running Programme was due to finish last week, so we would love to hear feedback. The Wednesday sessions will move into athletics after Easter; so is there still a desire to continue with a road running session? We will also need to set up a white-lining rota again; this worked really well last year as it means everyone only needs to take one turn over the season. So please let me know if you would be able to do this. Weather permitting next Saturday will be on Stinchcombe Hill again, so meet in the walker’s car park at 9.30am. We run at a gentle pace and stop fairly regularly so if any parents would like to join us you are more than welcome. Another exciting week for the DRC Juniors. Wednesday included an ‘Out and Back’ session where our athletes had to maintain the same or faster pacing on the ‘back’ as they had on the ‘out’. Thursday included some of the best all round great training that runners can do; hill reps.
Friday’s indoor athletics was extra exciting as we had our first chance to try out our brand new Reverse Boards. These boards allow our athletes to practice their maximum velocity running (sprints) and they work really well for Relay Races which is what we did. Even the coaches and some of the parents joined in for an exciting final. Sunday saw some great performances from our DRC Juniors in the final AAA Cross Country race at Pitville Park. Well done! It is half term next week and so there are no Weds/Thur/Fri sessions but we are hoping to do a Muddy Running trail run on Saturday. Parents welcome to join us check out the calendars for more details. Another busy week. Some longer distance running for the Wednesday runners, but some shorter speed-pacing control running for the Thursday runners. Friday was a jumping focussed indoor athletics. All great stuff; well done athletes. Saturday was the rescheduled KLB Cross Country. The only result I’ve heard is that Hannah Biddle ran an amazing race to come 3rd overall Junior Girl. Well done Hannah! Any other results out there let me know so that I can give them a mention. Normal week next week Weds/Thurs/Fri, Sunday is the AAA Cross Country race at Pitville Park in Cheltenham; a great course there with a little stream for our runners to splash in. A somewhat unusual week with the weather interrupting our programmes. Wednesday’s yr7+ Running session went well. Thursday’s session resulted in 4 coaches but only one U21 runner (who ran faster than most of the coaches), Friday was snowed off as was the KLB Cross Country race. 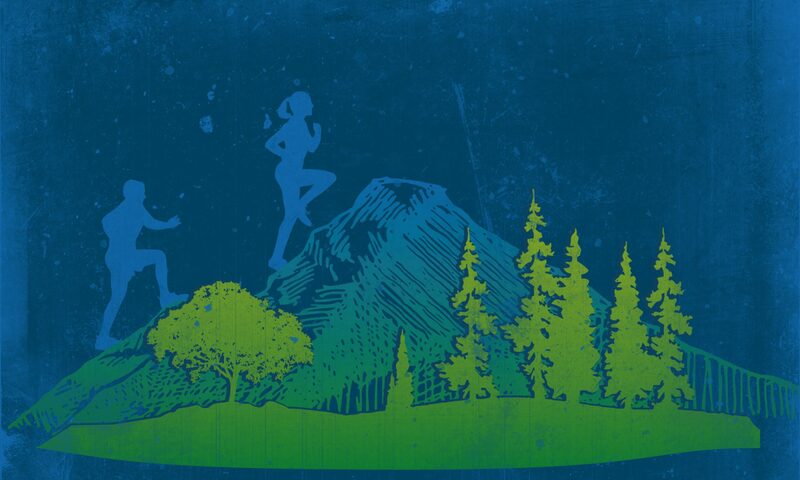 So in case anyone missed the info the KLB Cross Country Races have been rescheduled to the 9th Feb. We do have cross country training scheduled but if attendance is looking low then we may cancel that one (please let me know if you would like cross country training). I hope everyone got a chance to get out and enjoy the snow. The weather looks warmer for next week so hopefully back to normal.